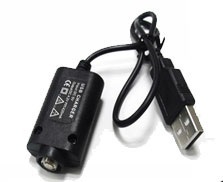 The Aqua Smoke USB charger is a perfect accessory to any of our rechargeable batteries. The USB connector will fit any USB enabled device including the Aqua Smoke AC adapter/wall charger. Simply twist the charger onto any one of our 650, 900, or 1100 mah batteries and plug into any available USB mini port or AC adapter. The charger features an LED indicator light which will turns green when a connection has been established, red while a charge is occurring, and off when a full charge has been completed.